We’re delighted to report that three Ashbourne students were honoured with CIFE awards in 2017. 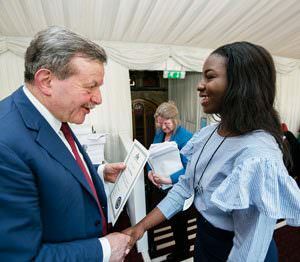 The students received their awards at a ceremony in the House of Lords hosted by CIFE President, Lord Lexden. 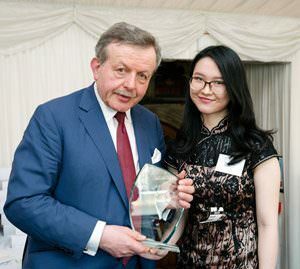 Xiaoyu Weng received an Andrew Osmond Maths award. Xiaoyu was our most academically able student. Behind her outstanding achievement in examinations is a virtually flawless track record in class work. The combination of her natural ability with her focus, discipline, and organization made her the most outstanding mathematics student at the school. In addition, she would often take the lead in showing other students how to solve problems. Her frequent questions indicate her ambition to broaden her knowledge, go considerably beyond the extent of the curriculum, and that she is reading considerably around the subject. This interest and devotion to mathematics is clearly in evidence from her A level results but also from her participation and achievement in mathematics competitions. Soala Ajienka received a CIFE award for Visual and Creative Arts. Soala was an exemplary student in every way and demonstrated a consistent ability to comprehend the theoretical framework that contextualized the works of art and architecture. She listens and learns from advice and criticism and is always open to trying new ways to extend her visual vocabulary. Her engagement is very much a ‘hands-on’, employing paint, collage, inks and mixed media. With her particular interest in architecture, which she is now studying at Cambridge University, she displayed an understanding of the structural, conceptual, and aesthetic aspects of architecture that was more redolent of an undergraduate student. Her ability to integrate such aspects of architecture into her own conception of architectural style and function was epitomized in her excellent EPQ project. 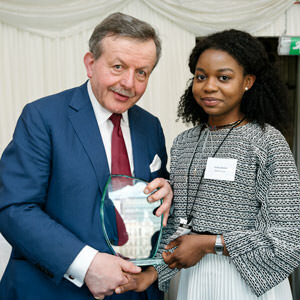 Tracy Nwokoma received a CIFE College Award for her contribution to life at Ashbourne. Tracy was one of Ashbourne’s most intellectually able and dynamic students of the humanities, whose inquisitive nature led to wide-ranging theoretical reading and high academic achievement. Though she came without any experience in Greek or Latin literature she took to the Classics with aplomb, demonstrating critical ability of a high order. In Biology she distinguished herself not only because of her research beyond the syllabus but also because of the helping hand she was happy to lend to others in the class. With interests and abilities extending from poetry to science Tracy is an extraordinary individual.